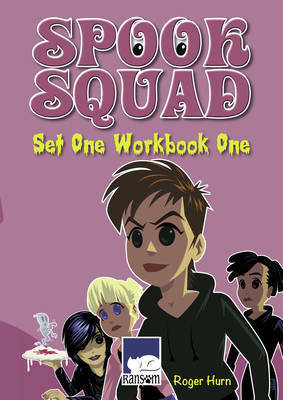 Spook Squad Set One Workbook One accompanies three of the titles inthe Spook Squad series; 'The Beast of Hangman's Hill', 'Ghouls in School'; and 'Bats in the Attic'. It includes teachers notes and photocopiable worksheets for literacy activities, drawing on the stories and materials in the books. Spook Squad is a lovely series of adventure books with lots of humour and great illustrations. Roxy has a weird auntie. Her Auntie Rhee lives on Hangman's Hill in a spooky house called the Old Tower. The Old Tower looks like Dracula gave it a make-over. But Rhee isn't a vampire - she is a banshee. She's trying to protect humans from ghouls, ghosts and long-legged beasties. But she can't do it on her own. That's why she needs the Spook Squad. The Spook Squad are Roxy, Leena, Nita and Emma and their poltergeist, Rattle. These four girls are as bright and sparky as a fire in a fireworks factory. So, on dark and stormy nights, when the vampires are being a pain in the neck and hairy horrors are on the prowl, the Spook Squad goes into action. Illustrated by Peter Richardson with fantastic black and white line drawings and full of jokes, 'facts' about the Spook Squad, maps of locations, these books are ideal for girls who want a fun read. Written by Roger Hurn, who has a knack for writing easy reading books with strong girl appeal. This series is a good starting point for getting girls into chapter books, then following on with Roger's series Girlfriendz.